WASHINGTON, March 26, 2019 /PRNewswire/ -- Douglas County, Colorado, is the healthiest community in America, according to the 2019 Healthiest Communities rankings by U.S. News & World Report, released today in collaboration with the Aetna Foundation. The second annual report and accompanying analysis are based on an evaluation of nearly 3,000 communities nationwide across 81 health-related metrics in 10 categories, from education and population health to infrastructure and environment. In addition to assessing which communities offer their citizens the greatest opportunity to live a productive, healthy life, the project serves as a tool to inform residents, health care leaders and elected officials about policies and best practices that help drive better health outcomes. "Through the Healthiest Communities initiative, U.S. News expands on three decades of expertise in measuring health care quality to assess how social determinants affect community health," said Eric Gertler, executive chairman of U.S. News & World Report. "Our second-year endeavor with the Aetna Foundation combines high-quality data with the power of journalism to engage communities about where they can improve and how they can learn from each other." The Healthiest Communities rankings, underwritten by the Aetna Foundation, are part of a $100 million commitment by CVS Health and its affiliates to making community health and wellness central to the company's charge for a better world. The new Building Healthier Communities initiative, which will be funded over five years by CVS Health and the CVS Health and Aetna foundations, builds upon the outstanding tradition of community investment by CVS Health and Aetna and advances CVS Health's purpose of helping people on their path to better health. "Through our support of organizations across the country, we know that the most effective and innovative solutions to improve health are consistently developed by addressing the needs of each specific community," said Larry J. Merlo, president and CEO of CVS Health. "The Healthiest Communities rankings continue to provide the insights that are essential to identify key issues and support community organizations, leaders and residents who are tackling the unique social determinants of health that impact their respective neighborhoods." In addition to an overall ranking of the top 500 communities, four peer groupings were developed based on counties' urban-rural status as tied to population density and economic status. The peer groups assure fair comparisons between communities and are categorized as: urban high-performing, urban up-and-coming, rural high-performing and rural up-and-coming. Iowa has the strongest presence in the Healthiest Communities rankings overall, with 62 counties landing among the top 500. Average community scores put Iowa among the top 10 states in four of the 10 broad categories assessed, including Population Health and Housing. Iowa's top-performing community, No. 26 Bremer County, takes top scores in walkability and low toxic releases. 81 counties are new to this year's top 500 communities, including Montour County, Pennsylvania, which improved in the Population Health category. Bath County, Virginia, saw significant progress in Education and Sweetwater County, Wyoming, rose in Environment. 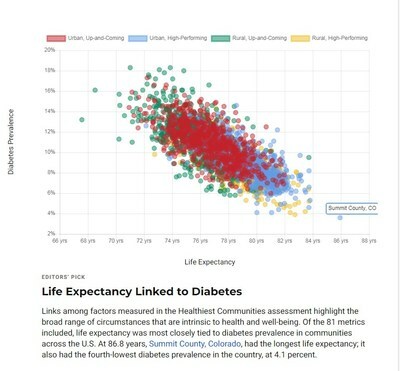 Of the 81 metrics included in the Healthiest Communities analysis, diabetes prevalence and smoking rate have the strongest correlation to life expectancy. According to Healthiest Communities calculations, Hawaii counties perform the best in the country in life expectancy, with an average of 81.15 years. Communities in Nebraska take 16 of the top 100 spots in the Mental Health subcategory, including Cherry County and Morrill County, which both score among the top 10 in the subcategory. The state has averaged 26 deaths due to suicide, alcohol-related disease and drug overdoses per 100,000 population; only New York state has averaged fewer "deaths of despair," with 25 per 100,000 population. The Healthiest Communities rankings are the centerpiece of a platform featuring in-depth reporting and analysis on community and public health issues, as well as comprehensive data covering the full spectrum of factors that influence population health. Healthiest Communities is part of U.S. News' expanding civic journalism portfolio, which includes the Best States and Best Countries sections that evaluate how government leaders and public policies best serve their citizens.